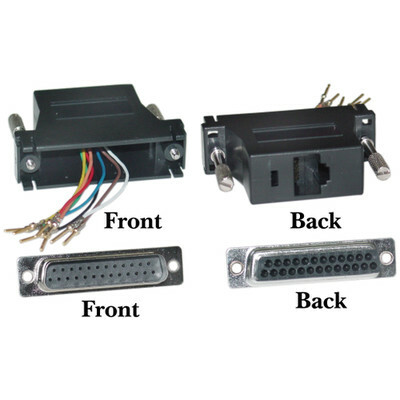 More Product InfoOur modular adapter will convert between a DB25 male to an RJ45 female port (or socket) and is generally used in long distances over phone lines or network cables. This adaptor's pinouts are easily configurable and adaptable to any needs you may have due to the increased leeway on these "flying leads." Ensure a quality bond within the DB25 male ports with nickel plated connections. Additionally, thumb screws guarantee a connection that is tight and accurate. This black DB25 to RJ45 modular adapter has a lifetime warranty, so you can purchase this modular adapter with confidence from CableWholesale.